Noted as “one to watch”, we chew the fat with Louis Korovilas to find out more about the chef behind Bancone. Fast forward 5 years and I was still there – I left my job as a scaffolder behind and was well on my way to working towards junior sous. The kitchen life suited me and I guess it was just meant to be. From there, I moved onto to Pied a Terre where I stayed for another 5 years. In my opinion, you need a good stint in any kitchen to fully learn the ropes and progress as a chef. Which brings us nicely to restaurant in question… how did this come about and what’s the idea behind Bancone? I honestly never imagined I’d be heading up a brigade of 10 at a restaurant like Bancone but through sheer hard work and thanks to my previous experience, I’m grateful to say I have. We’re a pasta restaurant and our key focus is to nail simple great tasting hand-made pasta. I’d describe our style as experimental yet still keeping hold of integrity to traditional Italian concepts. You’ll see a nod to Nordic and classical French influences on the menu and rather than focus on the protein, we choose to start with the veg ingredients and work from there. We work with seasonal ingredients to make the most of the best tasting produce. This even means in some months we’ll go without tomatoes until they’re back to their best, despite them being a staple in Italian cooking. 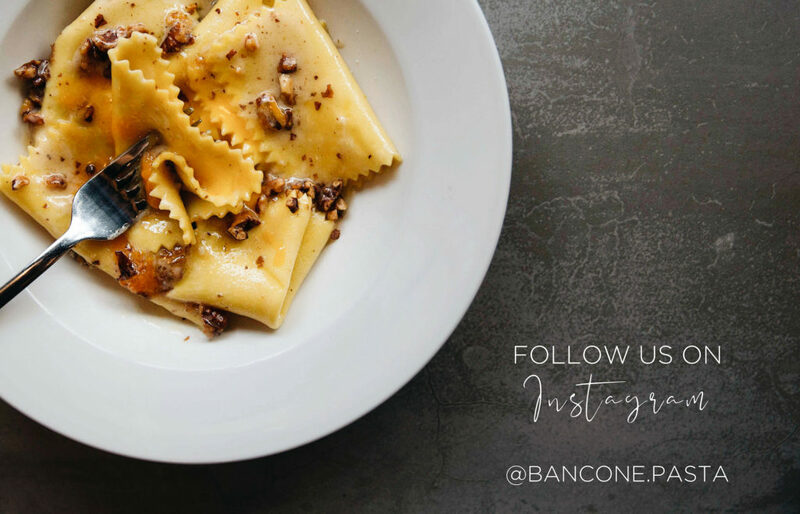 In a nutshell, Bancone is your go-to London pasta restaurant for casual dining. I want customers to feel confident to try something new in a relaxed environment. Ok, to start, I’d have to pick the rainbow chard, marinated anchovies, 8 year balsamic & pine nut salad. Chard is bang in season but there’s only about 3 weeks left so try it quick! And then, as the weather is turning, I’d go for the beef shin ‘ossobuco’ ravioli with saffron butter followed by the Earl Grey panna cotta. If you could pick anyone to walk through the doors of Bancone and have the pleasure of cooking for, who would it be? Richard Neat – he’s the chef that opened Pied a Terre 27 years ago. His energy and the way he cooks is inspirational. He doesn’t follow any rules and somehow, runs his kitchen in what can only be described as chaotic yet totally controlled. And finally, what can we expect from Bancone over the next coming months? For me, it always starts with maintaining a positive team. It’s important, not only to make Bancone a real London favourite but, also a restaurant that the industry aspire to work in. This will naturally reflect the quality of food we are putting out there. We’re not aiming to re-invent the wheel here, just a solid focus on taking time to perfect the quality of our pasta, do it way better than anyone else out there and let that do the talking for us.